We're always looking for some agile statistics to see how things are going. Here's some decent stuff from Scott Ambler, an agile thinker, author, practitioner of some renown. I heard Ambler give this live at a PMI presentation in Orlando recently. He's pretty animated when he talks live, so some of the energy of presentation may be missing from just the slides. 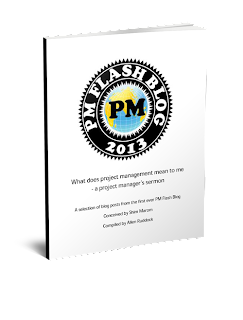 In 10 years most of what we think of as project management will be gone... some management will be around, but not like we know it. This didn't do much to motivate the room of PMPs to move to agile. It could take years to transition a large scale enterprise to agile... OMG, that sounds awful... but probably true, unless you just sweep out all the people and start over... it happens. A common sequence studied by change managers -- particularly business change managers -- is the so-called growth-maturity-decline triad. PMs experience the effects of this sequence more in the business case than in the actual project. After all, it takes a good deal of time to go through the business cycle; and it's not inevitable that the entire sequence ever comes about since managers intervene to redirect the business. And, the public sector is not immune: Agencies can go out of business, declining as constituent demands declines or gives up; and agencies can re-invent themselves for new constituent demands (it's not your grandfather's motor vehicle department, or bus line, etc). So, how does growth-maturity-decline look when viewed through the lens of projects? The real test between maturity and decline is whether or not there is new investment going into the business. In the decline stage, the emphasis is on cost control, efficiency, and getting the most out of existing product with existing customers; there's little or no investment beyond required maintenance. Over time, product will obsolesce and customers will move on. Growth investment is going into both customers and product, keeping both fresh and competitive. And, here's a challenge question: when is an expenditure a cost and when is it an investment? Sponsor attitudes are usually quite different depending on the view point. My answer: It's an investment when it goes toward making the future different from the present; that is: it's aimed at strategic differentiation -- to wit start-up and growth. Else, it's a cost required to keep things moving along as in the present for maturity and decline. And, you can extend the argument to people: the CFO carries people on the liability side of the balance sheet -- creditors (they provide time & talent) to whom we owe benefits, salary, etc. "The stonewall [to my briefing to a French audience that] .... was “principles-first reasoning” (sometimes referred to as deductive reasoning), which derives conclusions or facts from general principles or concepts. People from principles-first cultures, such as France, Spain, Germany, and Russia (to name just a few) most often seek to understand the “why” behind proposals or requests before they move to action. But as an American, I had been immersed throughout my life in “applications-first reasoning” (sometimes referred to as inductive reasoning), in which general conclusions are reached based on a pattern of factual observations from the real world. Application-first cultures tend to focus less on the “why” and more on the “how.” . Presentations: Make your arguments effectively by getting right to the point. Stick to concrete examples, tools and next steps. ... You’ll need less time for conceptual debate. Persuading others: Provide practical examples of how it worked elsewhere. Providing Instructions: Focus on the how more than the why. Persuading others: Provide background principles and welcome debate. Providing Instructions: Explain why, not just how. "Figure of Merit".... everybody got this, or should I say more? Some say FoM, of course. A figure-of-merit is a metric used to compare like objects or concepts where the metric itself may have no dimension or units of measure (UoM); or the FoM dimension is meaningless for day to day operations. You can also think of a FoM as a weight applied to separate the value or utility of one thing from its peers. A FoM may have no dimension because it is a ratio of two similarly dimensioned metrics, so the dimensions cancel in the ratio; it may have dimensions that are meaningless for anything other than that's how the metric got formed -- like days-squared. Sometimes, when you have no other way to compare something, a FoM, even if you make it up gives you a way to separate things and make decisions. Day to day in the PM domain, we run into a lot of stuff that needs to be compared -- one strategy over another, or one competitor over another, etc -- and there's no one metric that quite does it. You might look at a number of factors and baseline competitor A as a "10" -- a dimensionless FoM. All others are compared to the baseline. If competitor "B" is evaluated as a 20, or some such, and bigger is better, then B is twice as "good" or valuable as A on the basis of a figure of merit. And then there's the quantitative stuff, like risk variance. Risk is often judged by how far an outcome might be from the accepted norm or average value. But, this implies a direction ... how far in what direction? Maybe it doesn't matter. Perhaps you've got a situation where the direction is immaterial and it's all about distance. In that case, as in + or - from the average value, the way to get around direction is to square the distance -- now, everything is positive but, alas, the dimension is now squared, as in days-squared. That's ok, just think of the variance is a FoM: smaller is better! Who actually cares what a days-squared is? Nobody, actually. What's the return on diversification? Can you work this problem? How much better is the overall variance of your project? In other words are N smaller units less risky overall than the one big thing before it was divided? Answer: the overall risk is lower; the total variance of the project, calculated as the sum of all the variances of the smaller units, is lower than the variance of the one risky "big something" before dividing it up. However, the total average value is unchanged; you didn't change the size of the pie; you just sliced it up. If think of variance as a figure of merit for risk, how less risky is the overall project after dividing the big thing by N? Actually, it's pretty close to 1/N. That is, the sum of the variances of the smaller units is about 1/N the variance of the larger unit. So, what things in the project domain could benefit from the rule? How about: personal or business investments, tasks, and portfolios? All are all candidates for diversification. "I understand this from a conceptual point of view. It makes sense. But is there a way to calculate the point of diminishing returns [of dividing things up]? Obviously, this can be overdone and then we have so many smaller tasks that we spend more time updating action item lists and other project artifacts than getting things done." Quite right, there is a trade between managing the variance (range of risk impacts) and managing the overhead (See: anti-lean, non-value add) of smaller units. There's no calculation per se; it's a matter of judgment and circumstance. Typically, a work unit would not be smaller than a couple of weeks duration, and the scope is typically not smaller than what a handful of people can do in those couple of weeks. That said, overhead is one of those things that usually does not scale linearly -- control and monitor costs are often unrelated to the nature of the content and often poorly correlated with the scope of the content. Example: the time and cost of making earned value calculations matters not a wit what the scope is about, or how big it is, or what it costs. When the risk impact is not monetized, then you are into a qualitative judgment that only you can decide how big N should be. Eric Ries first defined vanity metrics in his landmark book, The Lean Startup. Ries says vanity metrics are the ones that most startups are judged by—things like page views, number of registered users, account activations, and things like that. So, what's wrong with this stuff? VMs are not actionable.. that's what's wrong. The no-VM crowd says that a clear cause-and-effect relationship is not discernible, and thus what action (cause) would you take to drive the metric higher (effect)? Well, you can't tell because there could be many cause, some indirect, that might have an effect -- or might not. The effect may be coming from somewhere else entirely. So, why waste time looking at VMs if you can't do anything about it? Causation: because you do X, I am compelled (or ordered, or mandated) to do Y; or, Y is a direct and only outcome of X. I sell one of my books (see below the books I wrote that you can buy) and the publisher sends me a dollar ninety-eight. Direct cause and effect; no ambiguity. Actionable: sell more books; get more money from the publisher. So, what is the actionable thing to do re X if I want you to respond Y? Hard to say. Suppose "r" is only 2/3'rds. That means: 2 out of three times you'll probably respond to X with Y, but a third of the time you sit on it .... or do something else I don't care about. Bummer! Here's my bottom line: on this blog, I watch all the VM analytics... makes me feel good, just as Ries says. But I also look at the metrics about what seems to resonate with readers, and I take action: I try to do more of the same: AM response, to be sure. I frankly don't see the problem with having both VM and AM in the same metric system. One is nice to have and may provide some insight; one is to work on! "Humanity's greatest achievements come out of our greatest pain"
One is drawn to think of other projects gone tragically off track ... Apollo 1 perhaps more intense, but like Apollo this program will go on as well.